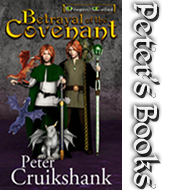 Betrayal of the Covenant Description: Tracked by minions of the evil Shin-il priests, the Dragon-Called twins, Rowyn and Willoe, journey on a quest to the Hoarfrost Mountains. These lands are rife with dangers, including savage Sköll Wolves and the fearsome Ice Giants, and may hide more than just the sought-after Sword and the Staff. Devices created by dragons and rumored to control the Others and the Fire Within, while preventing one of the twins from dying to satisfy the Covenant. As a friendship develops between a lonely priest and a prince, the priest must make unprecedented decisions that may have ramifications far beyond anything he could imagine. Click Here to order a copy, inscribed for yourself or to send to someone. 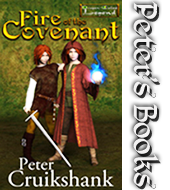 Click Here to purchase the first book in the series, Fire of the Covenant.